NJPA has been successfully serving its members for over 80 years by protecting, promoting, and enhancing the profession of psychology. NJPA is also an indispensable network of resources for the public and media and an influential presence helping shape mental health policies in New Jersey. 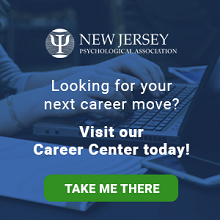 "The mission of the New Jersey Psychological Association is the advancement of psychology as a science, as a profession, and as a means of promoting health and human welfare in an atmosphere that supports the diversity of its members and the society at large." The New Jersey Psychological Association declares its intention to raise the consciousness of its members about issues of diversity. These issues include, but are not limited to race, ethnicity, gender, age, socio-economic status, sexual orientation, religion, disability, country of origin, and marital status. The Association is committed to addressing these issues and concerns in its programs and publications. NJPA does not support or endorse any non-licensed individual holding him/herself as a licensed psychologist. NJPA defers to the New Jersey Board of Psychological Examiners on matters related to licensure and regulation of psychologists in New Jersey. The NJPA Executive Board serves as the policy setting body of the association. Board members are leaders within NJPA who are recognized as having experience, insight, and thoughtful perspective on issues that are important to NJPA. It is the role of NJPA board members to actively participate in setting NJPA policy, developing goals and priorities, creating future initiatives, conducting strategic planning, and making proactive efforts to meet all the objectives set forth in NJPA's Mission Statement. The board adheres strictly to the NJPA bylaws and the conduct of meetings are governed by Keesey's Modern Parliamentary Procedure. Meet the Executive Board here.